Restless Chipotle » Want to Make The Ultimate Mudslide Cocktail? 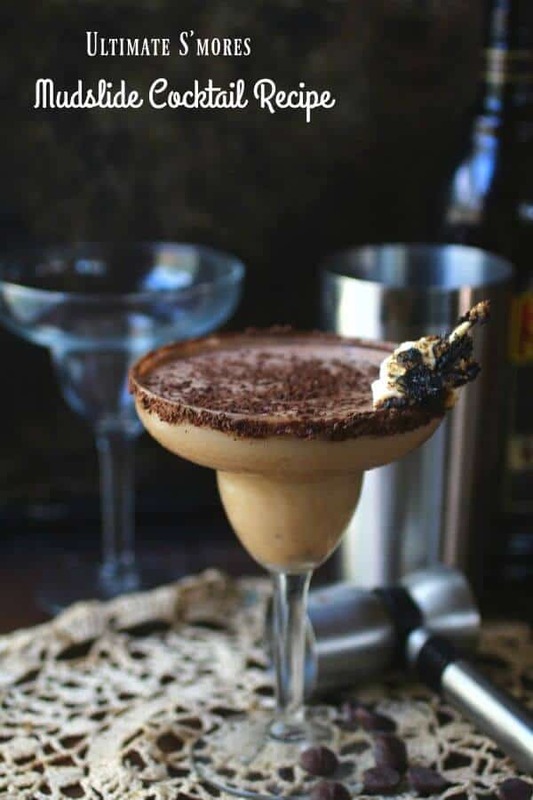 Want to Make The Ultimate Mudslide Cocktail? Of course you do! 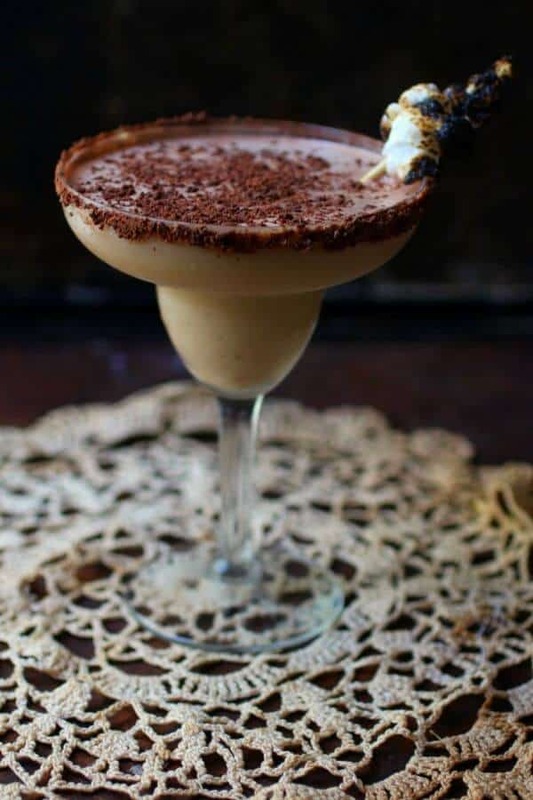 This decadent, creamy mudslide cocktail tastes like your favorite childhood s’mores with a boozy kick. Make up a batch of it at your next book club meeting and be sure to have copies of the recipe. Everyone will want to know how you did it. It’s no secret to anyone that I like girlie drinks. Pina Coladas, Hurricanes, Mai Tais… anything creamy, or fruity, or chocolaty is guaranteed to make me smile. I can’t tell you when I had my first mudslide but I can tell you that I immediately fell in love with it. Chocolate, cream, and coffee? Over the years I got a little creative with the mudslide cocktail. I’d add creme de menthe or chocolate ice cream… once I even blended a Snickers bar up in it. Even with all of the variations I made from frozen mudslides to white chocolate mudslides I never made on that tasted better than this. S’mores Mudslide cocktail is the ultimate, creamy-dreamy girlie drink. It tastes like you snuck away from the Girl Scout bonfire and dipped your s’mores into some hooch that your best friend snuck into camp. I’m serious! It’s a delightfully innocent childhood flavor with just enough bad to be good. I’ve made it with the S’mores Vodka by Three Olives in the past but this recipe is the one I like best. The S’mores flavored coffee syrup (I use Torani) really gives it that smoky-sweet campfire flavor. Every time you take a sip some of the marshmallow and some of the ground bittersweet chocolate stick to your lips giving you the complete experience. And, if you drink enough of these you might find yourself sitting next on the patio, a Bic lighter in hand, singing Kumbaya. They’re the type of drink that can sneak up on you. You can either use the Torani Sugar Free S’mores Syrup or the Torani Toasted Marshmallow Syrup to get that great s’mores flavor. I haven’t found regular s’mores syrup but the toasted marshmallow is awesome! Here’s that S’mores Mudslide Cocktail recipe! If you’re looking for a punch bowl drink try this Classic Southern Coffee Punch. Love this recipe? Please give it 5 stars! Sweet and creamy, the ultimate mudslide cocktail is full of chocolate and s’mores flavor. It’s just right for a special dinner or an evening with your favorite Rom-Com. Chop the chocolate chips very fine. Spread a thin line of marshmallow fluff around the edge of a chilled glass. Roll the edges of the glass in the chopped chocolate so that it adheres to the glass. Add the whipped cream vodka, Kahlua, creme de cocoa, Godiva liqueur, syrup, and ice to a shaker. Shake briskly for sever seconds and strain into a glass. Stir the heavy cream into the vodka mixture until well blended. Sprinkle remaining chopped chocolate on top. Stick the marshmallows on a small skewer. Toast with an open flame. Add the toasted marshmallow garnish to the drink. Put everything into the blender and blend until thick and smooth. Heat the heavy cream and syrup in the microwave until simmering. Let the marshmallows melt on top. Sounds amazing! I LOVE s’mores, and mudslides. YUMMMMM. That sounds like the perfect weekend drink! Love that marshmallow syrup!!! It is so yummy! The marshmallow syrup adds a lot, Jocelyn.. thanks!